With limited official development assistance available, governments like Jordan’s are seeking to work with the private sector to supply essential services like water and sanitation. MCC, a small U.S. government agency that partners with the best-governed poor countries to reduce poverty through economic growth, helped Jordan develop an innovative public-private partnership to fund the expansion of its environmentally friendly As-Samra Wastewater Treatment Plant, which now treats 70 percent of the country’s wastewater. Founded in 2004 with strong bipartisan support by then-President George W. Bush, MCC partners with countries to jointly develop and implement long-term, economically sustainable solutions to their greatest economic challenges. MCC catalyzes private investment for public good by helping its partner countries enact market-based reforms and develop innovative public-private partnerships. Private-sector participation in international development promotes innovation, increases sustainability, and helps establish a sound financial basis for the delivery of vital services. In 2010, after extensive economic analyses and public consultation, MCC and the government of Jordan signed a $275 million compact to transform key elements of the country’s water infrastructure to support economic growth and reduce poverty. Jordanian and U.S. economists agreed that stronger private-sector participation would help to improve Jordan’s approach to water management. The As-Samra Wastewater Treatment Plant, which was initially completed in 2008 with support from USAID, is the primary facility for treating wastewater for the five million residents of Jordan’s Amman and Zarqa Governorates. By 2010, the plant was already nearing operational capacity. To provide clean water for the country’s growing population, the government of Jordan needed an innovative solution to fund the plant’s expansion. Through the compact, MCC provided $93 million to expand the plant. Most critically, MCC’s investment helped mobilize an additional $110 million from the private sector and $20 million from the Jordanian government—resulting in MCC’s first large-scale public-private partnership in infrastructure. The project was financed through a structure known as “build-operate-transfer,” in which the government delegates the responsibilities of financing, designing, building, operating, and maintaining facilities to a private-sector entity for a set amount of time. The international investors in Samra Wastewater Treatment Plant Company Limited (SPC) include Morganti, a U.S. affiliate of the Greece-based Consolidated Contractors Group; Infilco Degremont, a U.S. affiliate of the France-based Suez Environment; and Suez Environment. Private finance was mobilized through the SPC from a syndicate of Jordanian local banks and financial institutions, arranged by the Arab Bank. The expansion, which was completed in 2015, increased capacity at the As-Samra plant by one-third. Farmers now have more high-quality treated water for irrigation in the Jordan Valley, which frees up fresh drinking water for households and businesses across Jordan. The plant is one of the most modern and environmentally friendly treatment plants in the Middle East, producing 78 percent of its energy needs through biogas and hydropower and improving management of sludge. SPC will operate and maintain the As-Samra plant until 2037, when it will be transferred back to the government of Jordan. As part of the compact, MCC and Jordan constructed more than 1,100 km of water and wastewater pipelines, trained thousands of citizens on best practices in water conservation, and strengthened the country’s water institutions and know-how. More than three million people across Jordan are expected to benefit from MCC’s investments. Affordable access to clean water is critical not only for households, businesses, and agricultural producers in Jordan, but also for a more prosperous and secure future across the region. 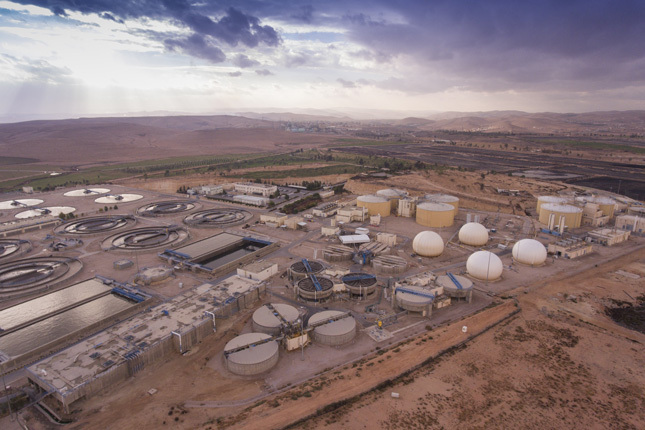 The innovative public-private partnership that financed the As-Samra plant expansion helped establish a sound financial basis for the delivery of vital water services in Jordan for years to come. This approach is now a model for MCC as it works with other partner countries to attract the capital, expertise, and innovation of the private sector to deliver high-quality, affordable, sustainable results. Alex Russin is resident country director for Jordan at the Millennium Challenge Corporation.